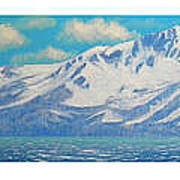 Lake Tahoe After The Storm Triptych by Frank Wilson - 30.000" x 7.250"
Lake Tahoe After The Storm Triptych framed print by Frank Wilson. Bring your print to life with hundreds of different frame and mat combinations. Our framed prints are assembled, packaged, and shipped by our expert framing staff and delivered "ready to hang" with pre-attached hanging wire, mounting hooks, and nails. 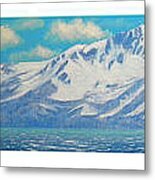 There are no comments for Lake Tahoe After The Storm Triptych. Click here to post the first comment. 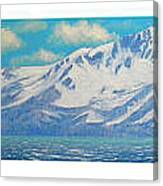 Painted on oils on a hardboard panel, Lake Tahoe After the Storm is a triptych consisting of three panels. The ones on either side are 12 x 12 inches and the center painting is 12 x 36 inches. The original triptych is available for $3,600. Contact me. I have made this triptych available as you see here as one large image with a white background which will look stunning as a Gallery Wrapped Stretched canvas print with white sides. A print with a black border is also available. 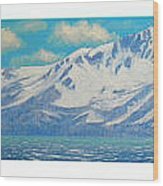 If you wish to have a different color background on your custom print please email me through my home page on this website.